MacArthur Blvd. 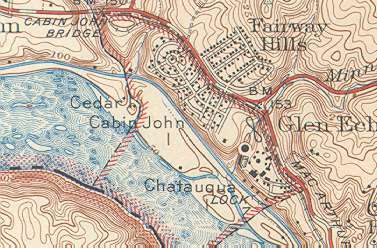 hasn't changed much in the vicinity of Glen Echo since this map was published. That may be because a large water pipe serving Washington is located beneath it and heavy loads could cause damage. The street car line no longer exists although remains of the trestles that it crossed may still be visible in some locations along the Potomac. The street car line ended at the Cabin John Bridge on MacArthur Blvd. and offered fast transportation to downtown Washington. 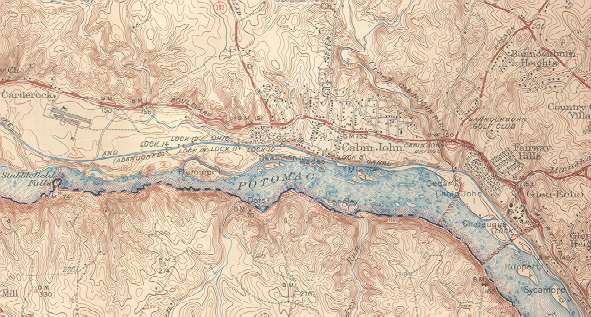 Notice that there are no parkways on either side of the Potomac River. The testing facilities at Carderock were present at this time. Great Falls Park (not shown) was also in operation and the trails to the falls overlook were in use. Later, flood waters wiped out the pedestrian bridges to the overlook and they were not rebuilt for many years. The figure 8 on the enlarged map of Glen Echo indicates the location of the roller coaster in the amusement park. Roller coasters were much simpler back then.